It feels like everyone started or went back to university weeks ago now, but for me I have only just made my way back into lectures. I’m not complaining though as it was lovely having a 4-month summer, even if I was working for the majority of it! Anyway, today I thought I’d share with you some of the little bits and bobs I have collected for my final year of university. No longer do I need to share with you lists of pots and pans, Tupperware and many other IKEA basics that everyone purchases for their first year, now I get to pick up little things to make my final uni house that little bit homelier. 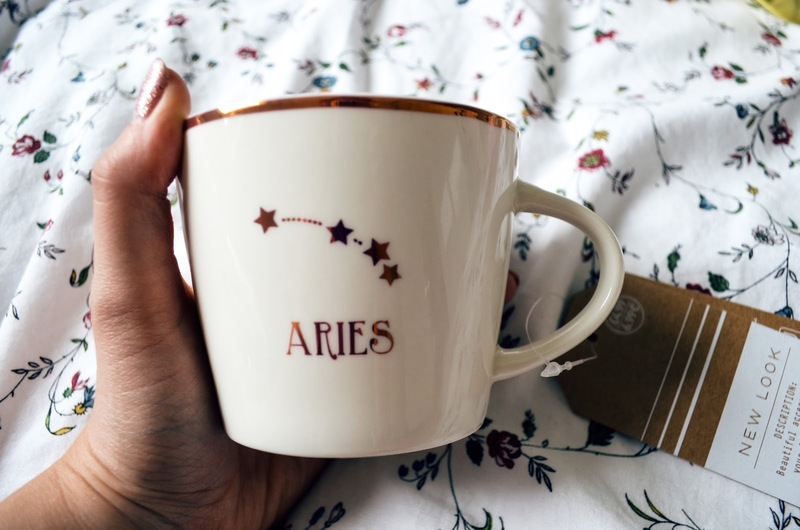 Mugs: I am a real hoarder of these, I literally cannot help myself from buying cute ones, but also I can be really picky about which mugs I like to drink out of… Silly I know but it’s got to feel right. I picked this little one up in New Look in their home section, mainly because of it having my star sign in rose gold on the front. Honestly I’m obsessed, stick my star sign on it and I’ll have it. Non-Slip Hangers: I cannot tell you how much of a lifesaver these have been over the years of having to deal with minuscule sized wardrobes in student houses. They save so much space due to how thin they are, and the velvet non slip texture means they are really useful for hanging up a few tops with straps on one hanger. I picked these up in Primark and as you can see they were only a couple of pounds for 10 hangers. Tote Bags: For those of you that are fresher’s, you’ll see how often shops give out tote bags in the first few weeks, even I’ve managed to pick up a few since being back at student shopping events etc. They are always useful to have folded up in your bag if you ever happen to being popping into a shop and pick up more than you expected. I always use them to keep my books from the library in so I’m not struggling to carry them, or use them to put my laptop in when I take it to university with me. Either way super super handy to have. Fairy Lights: Pretty much every room (at home and at university) that I have lived in has had a least one set of fairy lights in it. 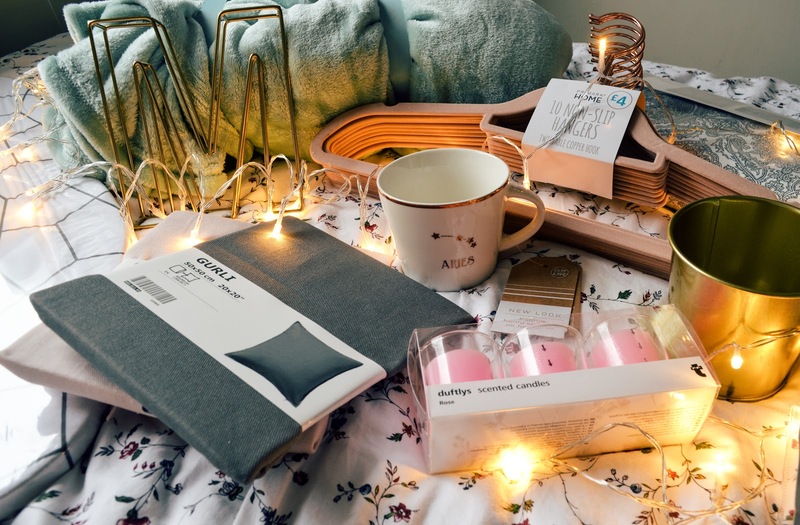 They make blank and dull student houses feel cosy and more homey. I picked up this battery operated pair in Primark, but as Christmas approaches its best to get tree lights as they last longer and can be plugged into a socket. Blankets: This blanket was gifted to me but it’s so big it covers my whole bed, which is so useful for keeping me warm when the weather gets colder. Ideal for draughty student houses! Candles & Tea Lights: I picked up this set of 3 rose scented candles in Tiger and purchased a pack of tea lights from ASDA, as I can use the glass holders once the other candles have burnt out. The main reason I purchased scented ones is because student houses tend to have a weird smell in them for the first few weeks until they have been lived for enough time, so hopefully this will make the house smell lived in a little quicker. Mini Ironing Board: As I have moved in with a different group of people for my final year, I no longer have the ironing board that one of my housemates brought along for the last 2 years. So when I found this mini one in IKEA it was perfect. I don’t tend to iron all of my clothes (lazy, I know) but sometimes my work uniform needs ironing or something has come out of the wash screwed up in a ball, making this super convenient to keep in my room. 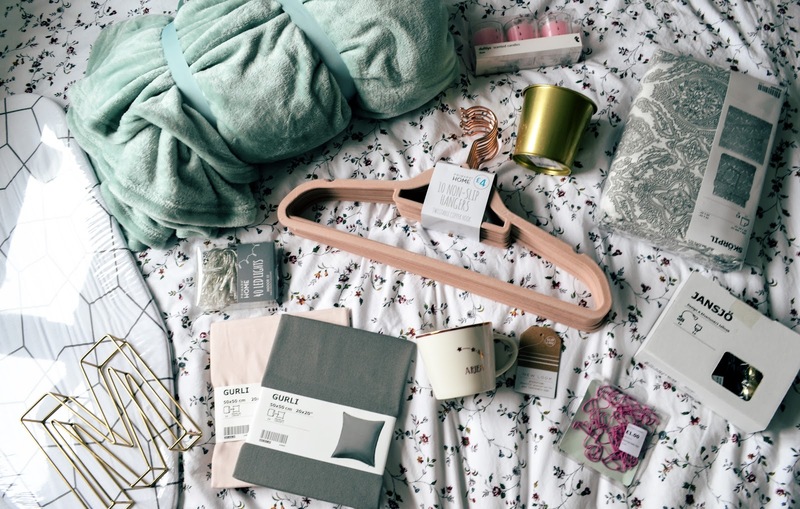 Pillow Cases & Bedding: I picked up the Skörpil bedding in IKEA which seems to be one of their most popular beddings as I know a few other people that have the same set. This was relatively cheap (around £15) for double bed sized bedding. As the design is quite subtle I picked up pink and grey pillow cases and the pillows (altogether for less that £10) to go with the other pillows I have on my bed. Make-up Storage: I purchased this make-up storage/organiser last year but it has been so useful I recently purchased the drawers that go with it as well on eBay for just a couple of pounds. I love being able to see my make-up so that some products don’t get neglected like they do when I am using a make-up bag. The little pots and copper tin I have some of my products stored in are also from IKEA, I think I picked them up in the stationary aisle, but they are perfect for holding my make-up brushes. Clip on Lamp: This is currently being used on my make-up stand for those early 9am lectures where there is not enough natural sunlight in my bedroom. It can be positioned however you like due to its bendy frame and the light is really bright. I feel like this will also get used closer to my deadlines when I am having to stay up later to get work finished. I picked this up in IKEA for £12. Succulents: Yes, I am jumping on the succulent trend band wagon. Just because they are super cute and add a little bit extra colour to my desk. This is actually my second one as I managed to drown my previous one in water… It seems I was reading an article on how to look after succulents but it was specific to a different type of cactus… Anyway, I kept hold of the original pot and replanted this little one I picked up in B&Q for just a few pounds, hopefully I’ll be able to keep this one alive for a bit longer. Stationary: I love making notes during lectures rather than typing them up on my laptop unlike most people on my course. I just much prefer having a physical notebook to flick through when it comes to writing my essays. I have been using the Stablio fine liners to add colour to my notes. These can be picked up in most supermarkets and stationary shops. Also these mini post it notes are ideal for readings, I use them as page markers when I am using a lot of readings and need to easily find quotes etc. Also highlighters are essential for my printed readings as I can flick through them and find highlighted content quickly. Notebooks: and finally, the notebooks I am using for this semester. I was gifted these for my birthday, but seeing as that was back in April and I was mid-way through a semester I decided to keep them for this year as I conveniently have three modules. They have blank pages, which was weird to get used to at first but actually makes it easier for me to make notes and add bullet points to make them more organised. So those are a few of the things I’ve picked up or brought back to Brighton with me to make my room and house feel a lot homier as I am finally living in a house that feels like a house and not a hostel! Hopefully I will have a room tour up for for you guys soon.